7. PART NUMBERS. The part number shall consist of the basic MS number followed by a dash number from Table I. 3. Design and Usage Limitations. These nuts are intended for shear applications. The steel nuts are designed to develop an ultimate limitations tensile stress (Ftu) of 70 KSI the aluminum nuts are designed to develop an ultimate tensile stress (Ftu) of 70 KSI for sizes -04 thru -3 and 35 KSI for sizes -4 and larger. The CRES nuts are designed to develop an ultimate tensile stress (Ftu) of 70 KSI for sizes -04 thru -8 and 58 KSI for sizes -9 and larger, and the copper base alloy nuts have no axial strength requirements. These ultimate tensile stress requirements are based upon the cross sectional area at the minimum minor diameter of MIL-S-8879 external threads, and will be obtained when the nuts are tested on bolts having a minimum ultimate tensile strength of 160,000 PSI. These nuts are designed to be used on 3A external threads. These nuts shall be used in accordance with the limitations of MS33588. 4. In the event of a conflict between the text of this standard and the references cited herein the text of this standard shall take precedence. 6. Bids shall be solicited only from the manufacturers or distributors listed on OPL-25027. Interchangeability Relationship. 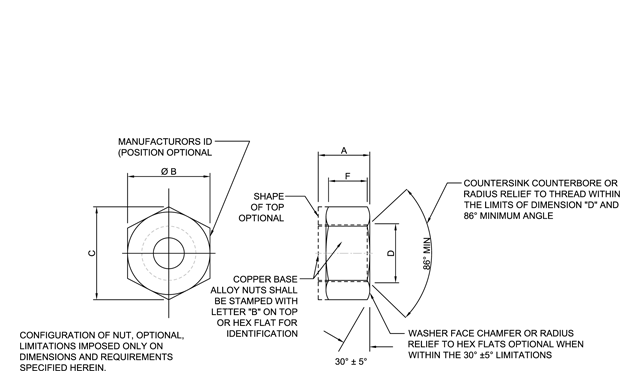 MS21083 nuts can universally replace AN384, MS20384, and MAS1022 nuts of like material, plating, thread size, and locking design (all-metal or with non-metallic insert). But these AN384, MS20384, and NAS1022 nuts cannot universally replace the MS21083 nuts.